There’s No Stopping a Kid with Jump Start Animal Adventure! The squid is running out of ink! With a poisonous fish at your tail, think fast and race to refuel. Which animal is the herbivore? Which is the carnivore? Snap pictures of animals to become an animal expert. SWing vine-to-vine with the Titi monkeys and help them gather bananas and coconuts. 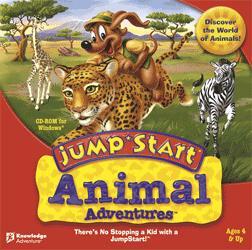 Want To Tell A Friend About JumpStart Animal Adventure! !